Once again the weather hit sport badly over the weekend and only one game survived in the North Northumberland League. The fixture between Bamburgh Castle and Alnwick Town Reserves went ahead, but only after the fixture was switched to the coast, where conditions were slightly better. In the end, Alnwick came away with a 2-0 victory to their credit, a result which helped lift them to second place in the Division 1 table. There was not a lot between the sides and an evenly contested first half, in which there were few chances, saw the teams turn around goalless. In the second half play was much the same until the 70th minute when the Bamburgh keeper could only parry a shot and Stephen Hutchins followed up to score. The lead was doubled straight after the restart when Richard Brown scored and although Bamburgh pressed they coudn’t find a way through the Alnwick defence . Bilclough Cup 1st round - Breakers Bedlington v Spittal Rovers; Craster Rovers v Ashington Central; Tweedmouth Harrow v Rothbury; Springhill v Embleton WR. Division 1 - Bamburgh Castle v Belford; Amble St Cuthbert v North Sunderland; Lowick United v Red Row welfare; Tweedmouth Rangers v Alnwick Town Res. Division 2 - Highfields United v Wooler; Forresters v Alnmouth. * Experienced goalkeeper Steven Mason has now officially signed on forBerwick side Spittal Rovers. 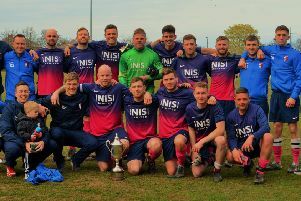 Mason joins the Seasiders, who are newcomers to the North Northumberland League this season, after a spell with fellow NNL outfit Lowick United. Mason, who has played in Spittal’s last two friendly fixtures, a has played at various levels including Junior Super League, East of Scotland, Northern Alliance and North Northumberland. He is a welcome addition to the squad in a position that has proved to be problematic at times this season. On Saturday, Spittal managed to beat the weather with a friendly against East Linton. Unfortunately they lost 3-0, but with other teams sidelined this was valuable match time.